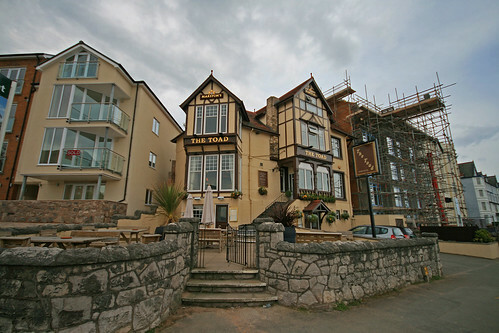 Situated on the promenade at Colwyn Bay, The Toad is a food orientated pub that has developed a good reputation amongst locals and visitors alike in recent years. It used be to known as the Toad Hall but the name changed when current owner Pete Hammond took over a few years ago and revamped the premises/menu. Curiously, the pub is on the first floor of the building, which means a climb up a flight of stairs to enter. It's very nicely furnished and still feels more of a pub than restaurant. There's a fair size menu, with all the usual favourites and they also have a Specials board. The food is well presented and portions are a good size. In particular, I can recommend the Homemade Cheese Burger and Homemade Steak & Cumberland Ale Pie. I'm also told that their steaks are very good. Nice selection of desserts, also. They have the usual choice of lagers/beers and a few Real Ales on offer - the Cumberland Ale is always popular. The Toilets and a Pool Table can be found downstairs (accessed via an internal stairway) and there is also a few tables outside for those warmer days. I've always found the meals and service there excellent. Pete Hammond and his friendly staff always make visitors feel welcome. Pier Pressure...or lack of it! Renovate or Rebuild: What's better for Llandudno?